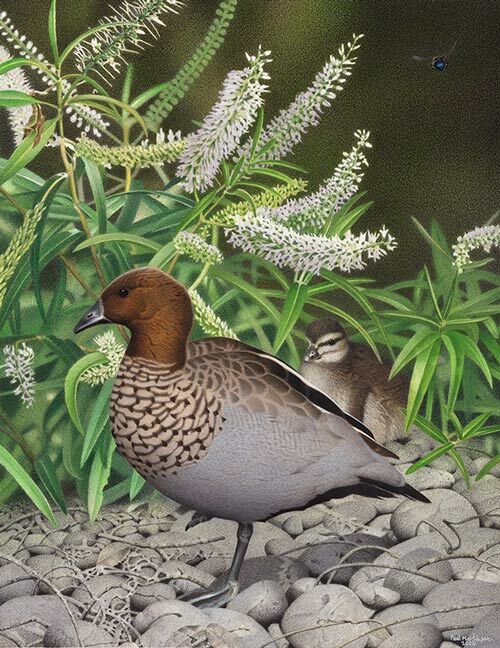 Finsch’s duck is one of 15 wetland bird species that have become extinct since humans settled in New Zealand. It was twice the weight of its nearest relative, the Australian wood duck, and its small wings suggest it was almost flightless. Bone deposits show it was one of the most abundant waterfowl. The Finsch’s duck was extinct by the 17th century, probably from a combination of human hunting and predation of eggs and chicks by kiore (the introduced Pacific rat).